In this post we’ll cover a topic they probably don’t handle in an MBA program: safe blood cleanup. While you as a business owner may be adept at managing your company, this is an area you should know at least a little something about, because sooner or later an unexpected death or crime at your place of business may result in spilling of blood or other bodily fluids. Knowing how to safely handle the situation is extremely important, because bodily fluids are classed as biohazards, meaning they can be a threat to life. All business owners should have a plan for dealing with cleanup of biohazards in situations such as a crime, suicide, or sudden death. That’s a good place to start. Both OSHA and the CDC have standards for handling biohazards such as blood, bodily tissues and other bodily fluids. OSHA has a “Hazardous Waste Operations and Emergency Response” guide you may find helpful. But having a plan and actually implementing it can be two very different things. It’s difficult to prepare for the unexpected, especially when it is traumatic. The shock of a trauma often makes it difficult to focus or quickly make decisions, but having some information on where to start with safe blood cleanup can help. 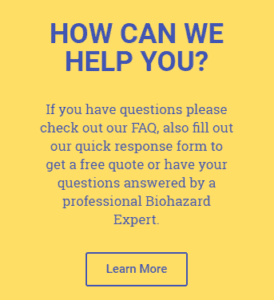 In most cases, your best option is to contact a biohazard remediation and cleanup company such as ours to take over. Safety of your employees and the general public should be your primary goal. There are legal requirements for the safe cleanup and disposal of blood and other biohazards. Most people aren’t trained in how to handle it, and general household cleaning products won’t take care of the health threat. Unless you know the procedures for safe cleanup of blood, we suggest you don’t attempt it. You could actually make the situation worse. There are a number of dangerous pathogens (disease-causing microbes) that blood can carry. And those pathogens can become airborne when blood is disturbed. Dried blood can ‘mist’ and carry bacteria and other infectious microbes into the air, depositing them in areas removed from the blood spill. You and those around you could inhale those particles as well. Should those particles get into an air handling system, they can be dispersed throughout the building. Blood can seep into anything porous – textiles like carpets and draperies, furniture, and even wood and wall finishes like paint and wallpaper. It can get into gaps between components as well as trim. Over time, blood-borne pathogens will become harmless, but the odors of blood left behind can attract rodents and insects, and they often transmit other infectious diseases. Do not ask an employee to tackle the task, unless that worker has been trained in safe cleanup and disposal of biohazards. You’re risking that employee’s health as well as opening up your company to legal action. Rapid, effective cleanup of blood is extremely important, regardless of whether the cause was crime, suicide, or even a death from natural causes. Bacteria and other infectious and dangerous microorganisms can spread quickly, and speedy cleanup is essential in containment. We understand that and are available 24/7, every day of the year. MedTech offers blood and other biohazard cleanup in Washington state as well as some surrounding Pacific Northwest areas. If you have a blood spill at your place of business, contact us immediately at (877) 691-6706. We have a quick response time and a reputation for safe and discrete cleanup.